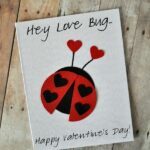 Love has definitely been in the air in my home as I’ve been working hard to create several new Valentine’s Day craft ideas for you this year. 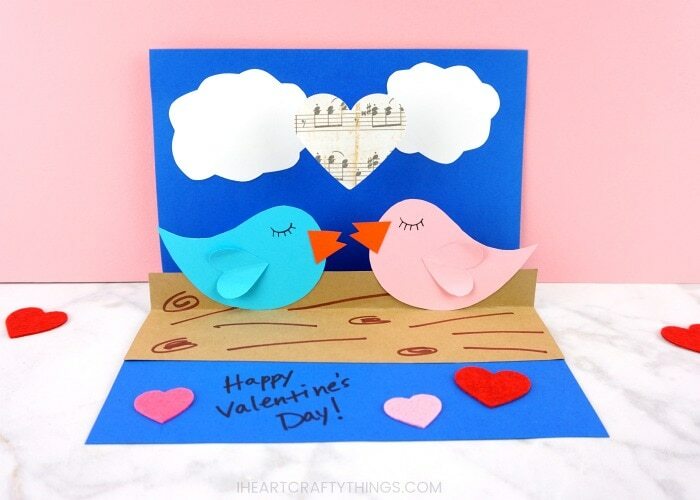 We are ending our Valentine’s Day theme this year with this super sweet pop-up love birds card and I just know you are going to love it as much as I do. 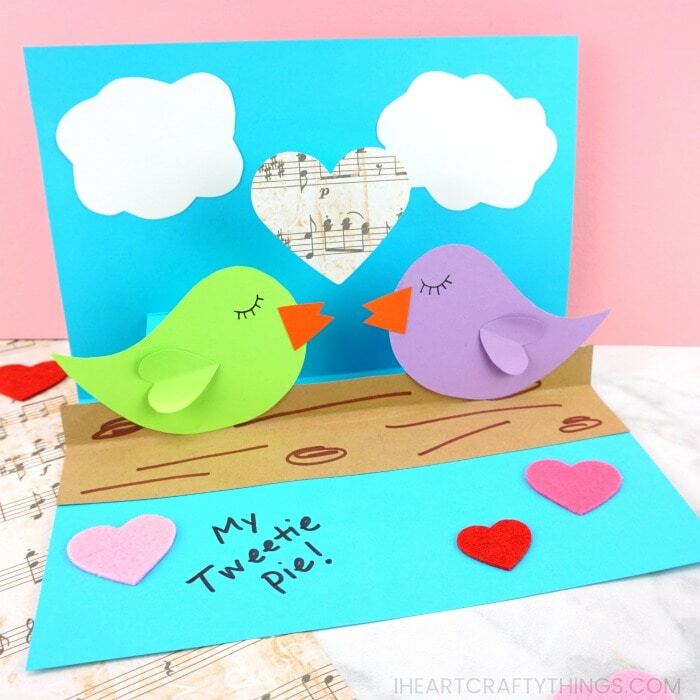 The love birds popping off the page sitting on a tree branch are adorable and the musical heart popping out above them adds a perfect finishing touch to the whole love bird scene. 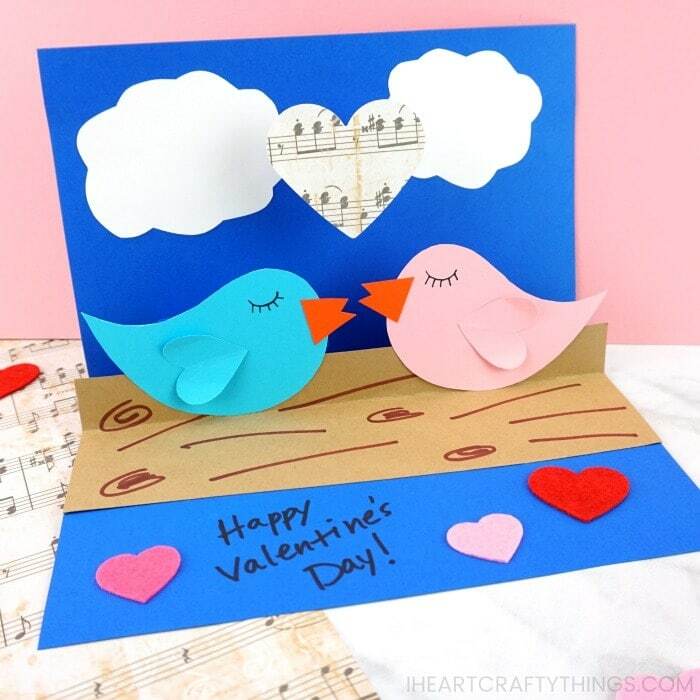 In this post, learn how to make this sweet pop-up love birds card with our helpful template, step-by-step tutorial and video. 1. Begin by downloading the love birds card template. 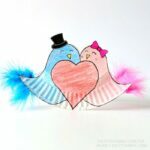 Print out the love birds on light blue and pink cardstock (or the color of your choice). You can also print it out on white paper and trace the shapes on your colored cardstock. Cut out two love birds and set them aside. 2. Cut a strip of tan cardstock about 3 to 4 inches by 8.5 inches. Use your brown marker to draw lines and knots on the cardstock to make it look like a tree branch. 3. Fold the top 1-inch of the tan cardstock down. Set it aside. 4. Fold your blue cardstock in half to create a card. Grab your scissors and about 1 1/2 inches from the inside of the edge, cut a 1-inch slit along the folded seam of the card. Cut another slit about 1 1/2-inches in from the previous cut. 5. Make two more slits on the opposite end of the card on the folded seam. 6. Fold down and crease the blue paper along the slits you cut. 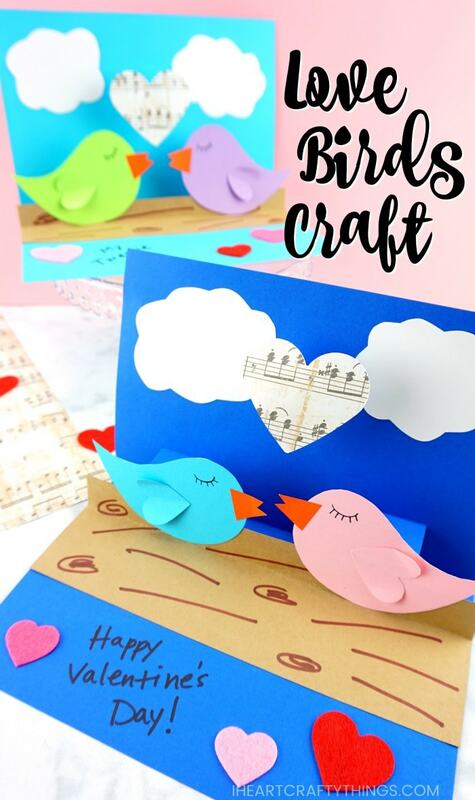 Carefully open up the blue cardstock again, invert the folded pieces of the paper so they stand upright in the crease to create the pop-out of the love birds card. 7. 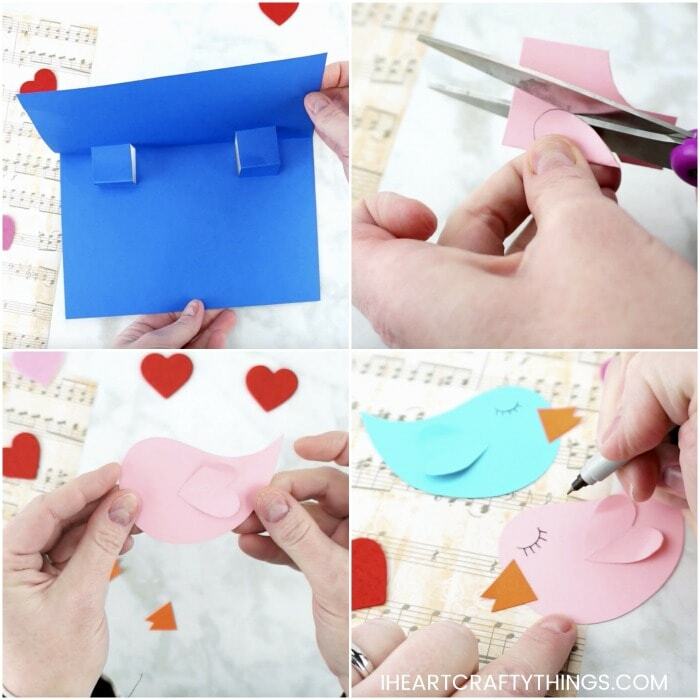 Use your leftover cardstock from your two love birds and cut out a heart shape from each of the scraps. Glue each of the hearts onto your love birds to make wings. We bend the ends of the hearts up to give them a two-dimensional look. 8. 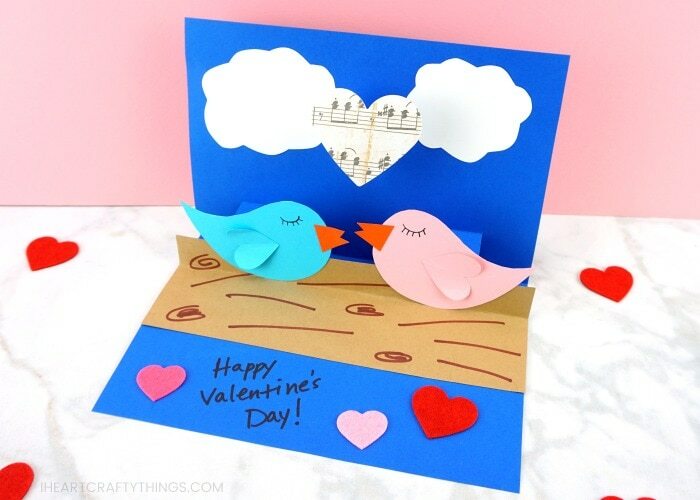 Cut two beaks out of orange cardstock paper and glue them on your love birds. 9. Draw closed eyes and eyelashes on your love birds with a fine tip black marker. 10. 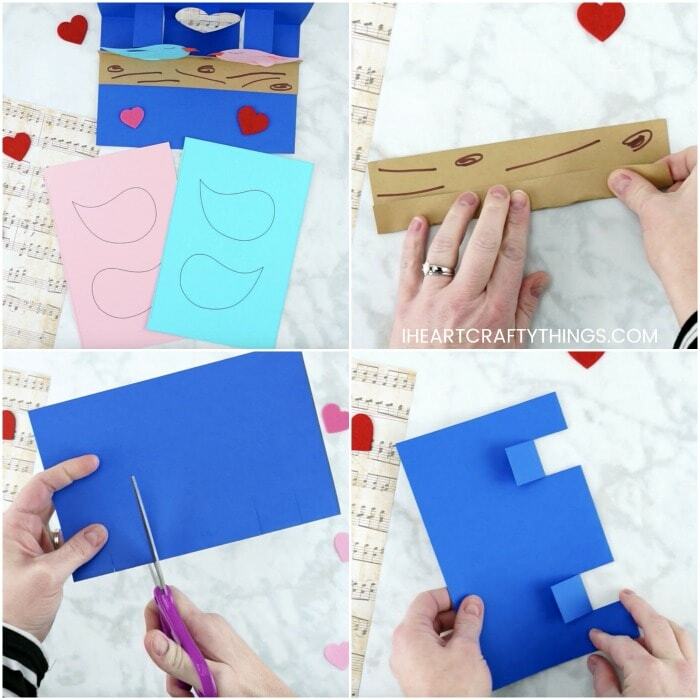 Cut out a 2-inch heart from your music scrapbook paper with your heart punch, or simply cut out a heart with scissors. 11. Cut out two clouds from white cardstock paper. 12. Cut a blue strip of cardstock about 3-inch long. Fold both of the ends inward about 1-inch. Add glue to one end and glue it to the back of the heart. 13. 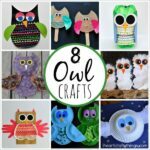 Add glue to the bottom of your tree branch and glue it on the bottom base of the pop-up card with the folded piece lining up with the pop out pieces of the card. Bend down the folded piece of the branch, add glue in the sections that line up with the fold out pieces, and attach them together. 14. Glue your white clouds at the top of your love birds card. 15. Put a generous amount of glue on the pop-out sections of the card and attach the two love birds to the card with them facing each other like they are going to kiss. 16. Add glue to the back folded section of the strip on the back of the music heart and glue it above your love birds on your pop-up card. Watch the video below to be guided through each step of this Pop-up Love Birds Card. It doesn’t get any cuter than this adorable Hedgehog Valentine. The hedgehog holding the 3D heart adds such a fun element to this simple Valentine’s Day card. 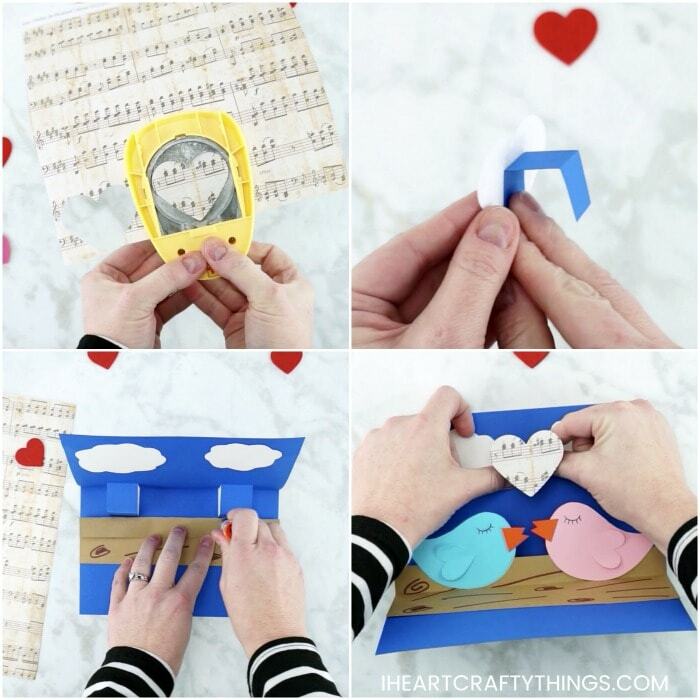 You can’t go wrong with this cute Robot Valentine Craft. Kids can use their creativity to make their own unique robot around our robot card template. Here is a sweet keepsake card for kids to make for Mom or Grandma of the child blowing conversation hearts to them. It’s a card that will be treasured forever.